The Schaefer family did well by the meat business and owned a large piece of land in nearby Dublin, CA. It was called Schaefer Ranch and once a year, Otto Sr. and then his son, Butch would invite his friends and family over for a barbecue. Imagine going to a barbecue hosted by butchers? Who wouldn’t attend? I was only 2 or 3-years old at the time but I remember getting in the car with my parents. My Dad sold his blue Chevy and used the money to buy a brand new blue Pontiac. 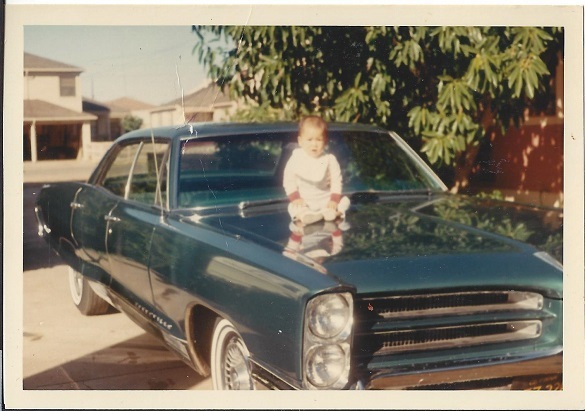 That blue Pontiac was special because it meant to my Dad that he had “arrived” in America and symbolized the fruits of his labor and a validation of his immigrant roots. He was proud of his American cars and the old family album has many photos of him and an American car. There’s one of me on top of the hood of the Pontiac. At the ranch, Mr. Schaefer had all kinds of meat on the grill. Guests could tour his ranch on horses. As a young man, Butch was an accomplished horse rider, meeting up with ranchers from all over the area, including ranchers from Santa Maria. When I was a young girl in the early 1970’s, my parents took me to one of the Schaefer’s BBQ and plopped me on top of one of his horses, making sure I didn’t fall down. And for a few short minutes, I sat on top of a fantastic animal, watching the yellowed hills around me, bleached by the summer sun. What is interesting is that in the early 1950’s during one of those barbeques, long before I ever visited, a discovery was made. Otto decided to cook that triangular shaped steak which was located next to the ball tip. He cooked it whole and then sliced it thinly; instead of cutting a thick slice and cooking it like a traditional steak. The flavor was marvelous if you sliced it thin against the grain. He chuckles now when he tells this story. The discovery got Otto thinking that this cut of meat could be sold as a steak instead of being ground up into the less expensive hamburger. Otto started talking to their retail customers and marketed the steak as “Tri-tip” because of its shape. He said once people tasted the tri-tip, its popularity started to spread. It was an instant success. The Schaefer’s also began cooking tri-tip at East Bay rodeos where the Santa Maria guys would show up. They liked the idea too. Butch estimates that happened around the early 1950’s. He said the Santa Maria Elks Club folks definitely popularized tri-tip but his father was the one that discovered tri-tip. It was delicious and marketable if you cooked it right (medium rare) and sliced it thinly against the grain. In part 5, I will share my story how my Father’s stories has led me to understand him better as a man and our journey as a family.